What would the Resurrection story be like from a weary Roman tribune’s point of view? From a hardened soldier whose main aspiration is to gain power in order to retire to the country to find peace, to live a day without death? This is the premise of Risen, which came out in 2016, featuring Joeseph Fiennes and Peter Firth. Most, if not all of the Easter films I have watched, focus on events leading up to the crucifixion. Risen starts afterwards, beginning with a convincing skirmish with Roman soldiers and the released Barrabbas. Clavius, a career Roman soldier, played by Joseph Fiennes, is the one who is sent by Pilate to speed things up, to end the “rabble” noise. Clavius does so by going to the site of the three crucifixions taking place. He orders two of the three to have their legs broken, which painfully quickens the already excruciating death on the cross. As the third victim is about to suffer the same, Clavius notices a group of women weeping, and learns it is the mother. This is where the audience sees beyond the tough exterior of this Roman soldier, setting up the film. Clavius instead orders the pilium, and the suffering ends immediately with the swift piercing. From this point on Clavius remains involved with this man’s death. He is sent to have the tomb sealed, and when the body vanishes, he becomes a dectective trying to solve the mystery. This is a brilliant, if not unique way, to present the Resurrection story. As Clavius, Joseph Fiennes, projects a weariness from his 25 years of soldiering, that begins to soften his judgement, yet his professional training remains intact. As Clavius searches for the missing Yeshua, he begins to find truths that he cannot reconcile with what he knows, and this truth changes him as searches for answers. Having watched the Easter films of the past, The Robe through The Greatest Story Ever Told, and even The Passion of Christ, I was at first reluctant to watch yet another film about a story I knew so well, that whenever I watched a retelling my emotions absolutely pulverized me: joy, awe, anger, devestation, exultation. I wasn’t sure I wanted to go through it all once again, even though the story is ultimately uplifting. 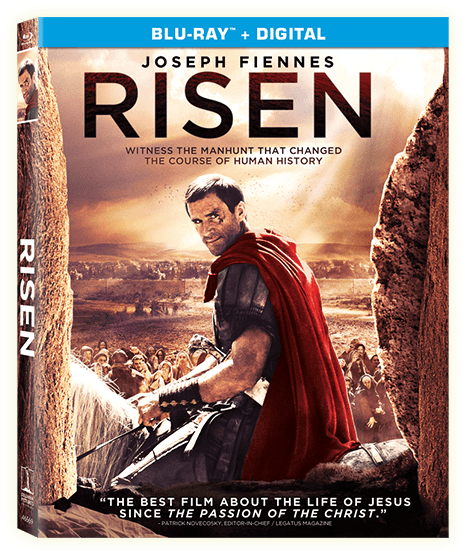 Risen, having now twice watched it, creates a sense of wonder, a sense of satsfaction, one of peace. Joseph Fiennes brings his polished acting skills to the role, providing subtley to his part. A sigh, a flick of an eyelid, a wary side look, a folding of arms all say so much when he says so little. This Roman, this Clavius, is a man of action, one of precise movement and logic, yet events he becomes involved in as he searches for Yeshua at Pilate’s demand, renders him watchful, cautious, and we see him slowly transform as he realizes he will never be the same. I appreciate Sony’s dedication to producing intelligent, thought-provoking family films that take on inspirational subjects. The stories are well-written, finely directed, and showcase notable actors. Most find their way to the theatre circuit and do well, which sends the message that family entertainment with a message is valued. He is risen, and I hope you and yours embrace this season of wonders.